Over 630 people attended the first three performances of God Touches and on the final evening the cast received a standing ovation. With ticket sales, patron donations and program ads the first production finished with a net financial gain to its sponsoring organization, L-A Arts. 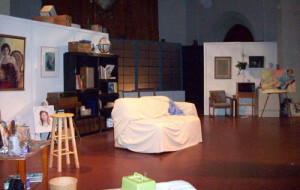 Component built, the main set for the play is an artist’s warehouse loft, now in storage, which can be transported to theatres in New England and beyond in a single rental truck. It sets up in two to three hours. Built for a performing arts center platform it is more appropriate to larger stages, but can be scaled down for smaller ones – or a simpler set approach be used altogether. Copies of the script are available to theatre directors and non-profit organizations considering the play’s production at no charge. To request the script please fill in contact fields below. Use of these materials for production is protected by U.S. and International Copyright law and requires written permission from the author in a standard theatrical contract. 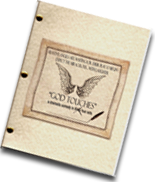 Copies of the script are also available to individuals either through payment by check or via PayPal. Bound with brads between parchment or linen cover stock, the script is (unlike the standard-format play) presented in a reader-friendly style where stage directions blend organically with the actors’ words. The cost is $15 for the script, plus $5 for Priority Mail Shipping. Purchases by individuals may also have the script signed by the author if desired, and a message box in the order window is provided for this purpose; please indicate your request in a note if ordered by check. And thank you sincerely for your support of God Touches. Theatres and Non-Profits please fill in the contact information here (including the name, address and phone number of your theatre or not-for-profit organization in the Message field) to receive a copy of the script and other production-related materials.